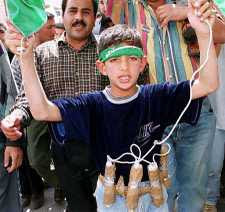 Baghdad - Extremists in Iraq have used a 10-year-old child for a suicide bomb attack, the Al-Hayat daily reported on Monday. Sheikh Sahir Abdul-Jabar told the paper, the suicide attacker who had blown himself up during a meeting of sheiks in Diyala province on Friday had been identified as a 10-year-old boy. The sheiks were discussing a reconciliation initiative and joint action against terrorism when the explosion happened. Six of them died in the explosion. I know these guys are going to rot in hell, Lucifer is expecting them. I would gladly punch their ticket. Where's the Enemedia outcry over this? If our soldiers had taken out this little jihadi before he blew himself to bits, it would have been front page news no doubt. Disgusting.